1. On your machine or mobile device, open up a browser window (we recommend Google Chrome or Firefox). 1. While logged on any computer on our campus, press Ctrl+Alt+Delete. A window will appear where you may select “Change Password”. 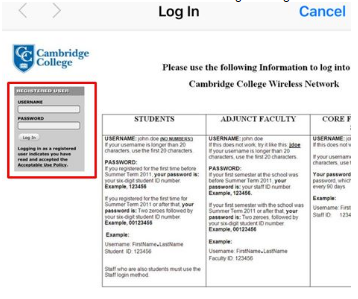 · If you are a student or adjunct faculty and you have reset your password from the original 00+ID number (ex: 00123456) you may reset your password through the password reset portal located https://pwd.cambridgecollege.edu/. Please note for your security, core faculty and staff may change your network password. While logged on any computer on our campus, press Ctrl+Alt+Delete. A window will appear where you may select “Change Password”.